Feathers develop in feather follicles which are obliquely implanted in the dermis of the pterylae. See also feathered skin. The rachis of a feather is the distal part of the central shaft which carries the vane (the barbs); the calamus is the bare proximal part, embedded in the follicle. 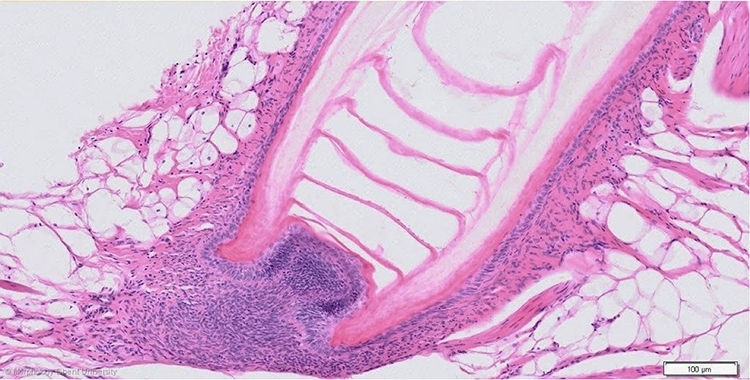 The wall of the follicle consists of a thin epidermal layer surrounded by a dermal connective tissue to which the feather muscles (mm. pennati, mm. pennarum NAA) attach. At the base of the follicle, a dermal papilla covered by a thin layer of epidermal cells projects upward. The proliferated zone at the base of the feather where the epidermal layer of the papilla is continuous with the epidermis of the follicular wall is called the epidermal collar.